Hello friends, Today I will tell you a method on how to change brightness on Windows 10. Users can turn the screen backlight. I have share 5 methods to increase or decrease the brightness of your Windows PC/Laptop. Users can use this method to adjust the light of their desktop. You don’t need to download any software or app to change brightness on Windows PC/Laptop. Windows 10 can customize itself entirely as compare to other Windows versions. Some of the fantastic customization options are like synchronization, mirroring screen, and many more. Similarly, to change brightness on Windows 10 it is also a part of customization. Well, if you are trying to know that how to change brightness on Windows 10 then this section is going to help you a lot. I have shared some best methods to get an idea that how to change brightness on Windows 10 very quickly. However, it is very significant that we must learn how to change brightness on Windows 10. Because this will help us to save the battery when we are not using the PC/Laptop. Am I right? So, let us have a look at the guides which are listed in this section. Keyboard’s hotkey is those things which consist of some pre-defined shortcuts in them. In every PC or Laptop, there is a hotkey to change brightness on Windows 10 and other OS. A person can use this hotkey to adjust the screen brightness of his/her PC/Laptop. This is a quick way to change brightness on Windows 10 and other operating systems as well. I have listed step by step guide and the hotkey which you have to use to change brightness on Windows 10. So, let’s have a look at the method. Look on to the function keys. You will see the icon of light. Use the dim light icon to low the brightness. Otherwise, use the dark light icon to high the brightness. The hotkey lies between F2 to F5. Control Panel is the hub of all settings in Windows PC/Laptops. If you want to know that how to change brightness on Windows 10 then Control Panel is the best place where you can learn it. Well, it is difficult to find some particular settings in control panel but not much as you are thinking. Hence, I have given the details of the procedure which you have to follow to use the control panel to change brightness on Windows 10. Open Control Panel on your Windows 10 PC. Now, click on Hardware and Sound option. Then, click on Power Options option. After that, you will see Screen Brightness on the center-bottom of the page. Use it to adjust the brightness on your Windows 10 PC. In Windows 10 PC, there is a settings app which can be used for making some small changes using the setting of that app or item. 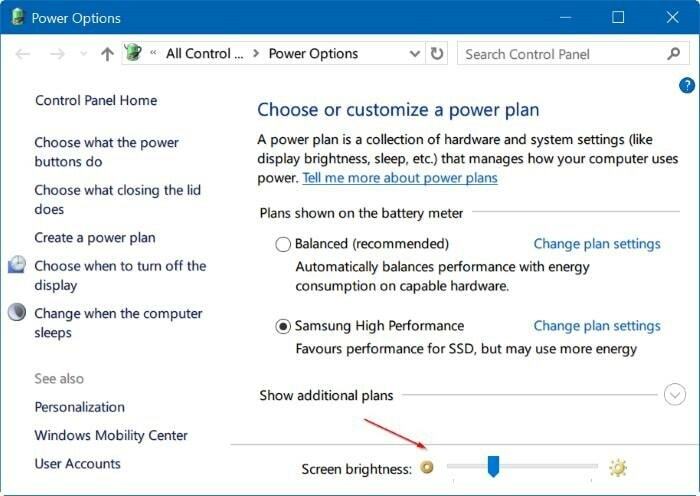 IF you want to change brightness on Windows 10, then you can take help of this settings app to adjust the screen brightness. 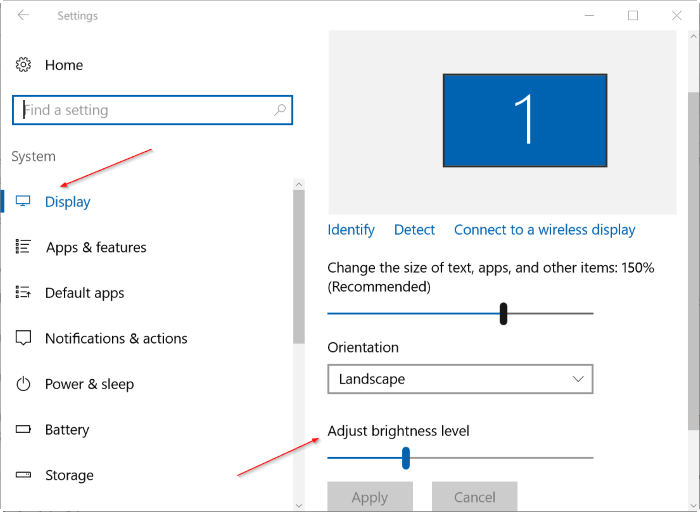 Here, I have shared a step by step guide so that you can learn that how to change brightness on Windows 10 using that settings app. Now, you will see the Adjust brightness level option. Use the bar to adjust the screen brightness. Action Center is the new concept which is introduced in Windows 10 operating system. The Action Center contains the basic settings about the items which are present over there. In the Action Center, there is an option to change brightness on Windows 10. So, we can take help of the Action Center to know that how to adjust brightness on Windows 10 using it. Click on the Action Center icon. Then, click on brightness tile. Now, use that tile to increase or decrease the brightness. DimScreen is free of cost software which will help us to change brightness on Windows 10. This software is very light weighted as well as easy to use so that you are not going to face any kind of difficulty while using it. A user can easily get it from its website to use it for changing the brightness on Windows 10. Let’s have a look on the way which I have shared below to know that how we have to use it. Get the DimScreen software form its website. Now, install it and then open it. After that, you will get the bar to adjust the screen brightness. Just scroll that bar at the amount of your screen brightness. That’s it. Leave the app to run and do your job. Using these superb methods, you can know that how to change brightness on Windows 10. All the methods told above are very simple and straightforward so that it will be easy for you to understand them quickly. I have shared four methods which use the inbuilt functionality of Windows 10 OS. Where the fifth method uses software which is very light weighted and easy to use if you are trying to change brightness on Windows 10. I hope all the methods have now taught you that how to change brightness on Windows 10 in different manners. 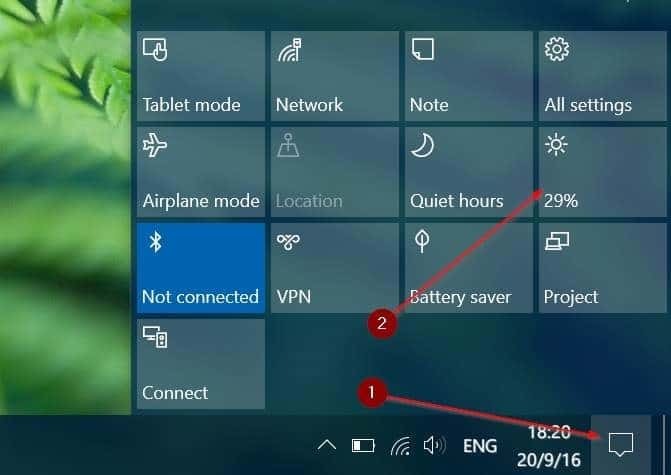 You can share this fantastic article with your friends also so that they can learn how to change brightness on Windows 10 quickly.